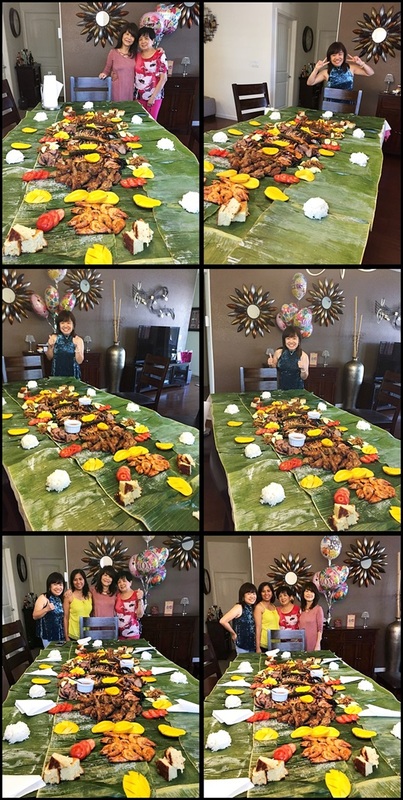 Nothing lost but gain in this Boodle Fight we had on Mother's Day in Sacramento. Why is it called Boodle Fight? 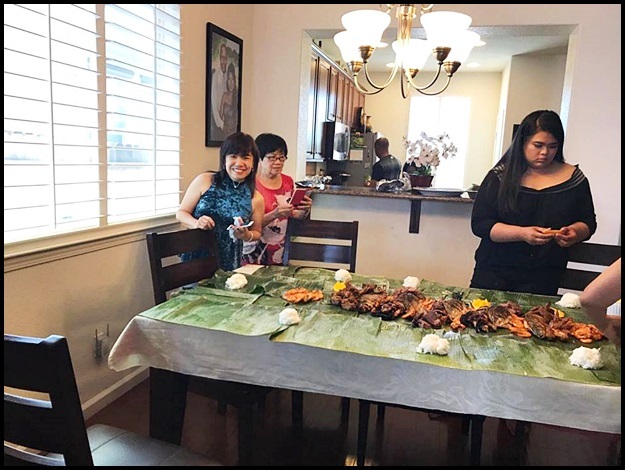 According to Filipino culture, a Boodle Fight is the military practice of eating a meal, only that there is only military man involved here. LOL..
Our array of food for eight people only!! And many pictures before the START!! My Belated Mother's Day Post!! Happy Occasion To All The Mothers!! I read about Booble Fight on another blog too years ago. Sounds very interesting to eat like this. Something similar to our own country culture..
wow! that sure is a lot of good food. is it easy to get banana leaves? happy mother's day to you too! Saw a friend's Filipino wife serving this at their house for dinner. They have something like this in Malaysia, all seafood cooked with curry powder but not served on banana leaves - that puts me off and I hear the seafood may not be all that fresh, the cockles are very small...etc...etc...etc...so I have never tried. I heard of the Filipino tradition. It must be different and excited to experience different way of enjoying food.